An Emergency Position Indicating Radio Beacon (EPIRB) is a safety device carried by a vessel to alert search and rescue services and allow them to quickly locate you in the event of an emergency. When activated it transmits a coded message on the 406 MHz distress frequency which is monitored by the Cospas-Sarsat satellite system. Designed to meet the requirements of both the commercial and recreational user, the McMurdo SmartFind E8 EPIRB features transmits on 406 and 121.5MHz and includes a high brightness LED light which helps rescue services locate you at night or in poor visibility. Location is determined within 5km (3 miles) by measuring the doppler shift of the EPIRB’s signal through the Cospas-Sarsat network. Once in the area, rescue services are then able to pinpoint your precise location using inbuilt 121.5Mhz homing transmitter. 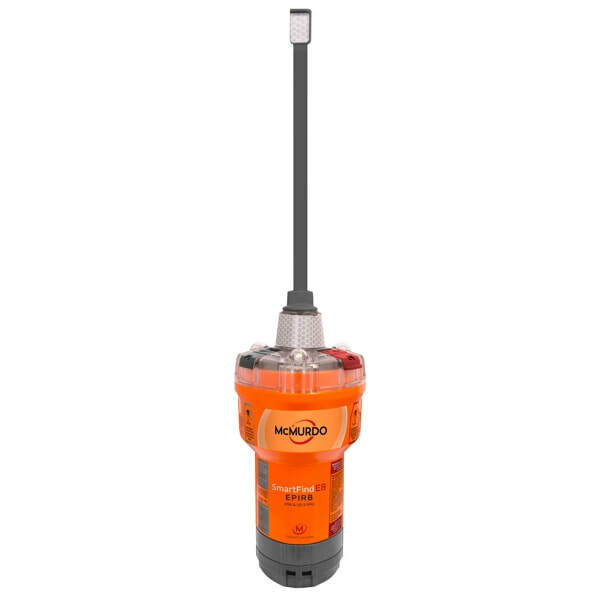 The McMurdo SmartFind E8 EPIRB also features faster alert detection on the 406MHz frequency though compatibility with MEOSAR, a new search and rescue infrastructure which will be rolled out by Cospas Sarsat. When fully deployed the aim is: Determine beacon location within 5km, 95% of the time, within 10 minutes. Near instantaneous beacon signal detection using bent pipe technology – average 46 minutes faster compared to LEOSAR. When fully operational next generation beacons will also have a return link signal through Galileo satellites : Acknowledge signal receipt and Control beacon – remotely activate, turn off or confirm false alarm.